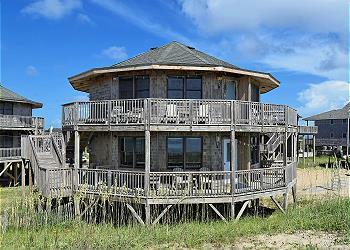 Our oceanfront rooms have a priceless view of the Atlantic Ocean and semi-private deck. These spacious rooms have one king bed, full bath and all the standard amenities. 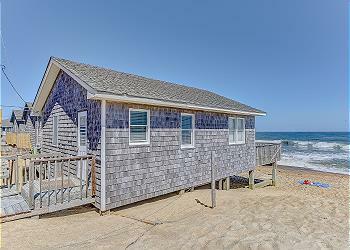 This upper and lower level oceanfront duplex Round cottage has incredible panoramic ocean views. The master bedroom features a king bed and full bath and the second bedroom has two double beds with hall bath. These spacious loft suites offer the most spectacular view of both ocean and sound! Our 3rd level oceanfront rooms have a priceless view of the Atlantic Ocean. Watch breathtaking sunrises as you enjoy morning coffee or scout for dolphins playing in the surf from semi-private decks. Situated mere steps from the beach with an unobstructed ocean view from dual sundecks, this oceanfront home is a getaway you’ll never forget. Completely remodeled for the 2018 season, Ocean Point is a comfortable escape for the whole family. These spacious suites offer 2 semi-private decks, a full kitchen and all of the comforts of home. These suites feature a king bedroom, queen pull-down wall bed in the living area, and one bath.